The SVQ 2 Sports Turf: Groundsman at SCQF level 5 allows learners to demonstrate competence in their particular area of work. 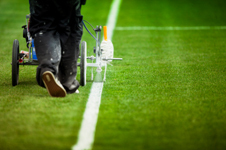 It covers areas such as: maintaining the health and condition of sports turf; renovating and repairing sports turf surfaces; establishing crops or plants; preparing and using equipment and machinery; monitoring and maintaining health, safety and security; working relationships; and improving performance in a business environment. The SVQ 2 Sports Turf: Groundsman is available through employers and training providers. The SVQ 2 Sports Turf: Groundsman at SCQF level 5 is a re-accredited qualification. Learners can progress to a range of qualifications including Level 3 SVQs in related areas or a range of Horticulture Higher National Certificates and Diplomas (HNCs and HNDs). The achievement of other qualifications such as the National Certificate An Introduction to Horticulture at SCQF level 4 can contribute towards the underpinning knowledge required for the SVQ. The SVQ 2 Sports Turf: Groundsman at SCQF level 5 consists of eight mandatory Units and two optional Units. For details of the Units making up the SVQ, please refer to the Qualification Structure (248 KB).